Anaerobic pathways involve decomposition of organic material in biological sludge in the absence of oxygen to convert the material to different variety of end products, mainly methane and carbon dioxide. It can be used in the stabilization process of wastewater treatment plant sludge and to certain degree some industrial waste as well. 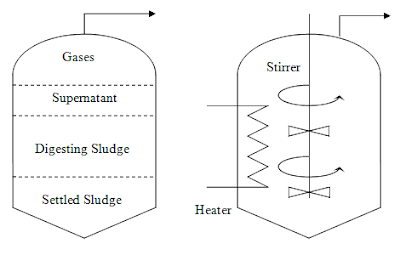 The anaerobic suspended growth process for the conversion will take place and occur in an air tight reactor and there are different configurations available with some of those commonly used are the anaerobic contact process, complete-mix digestion, two-stage bed leachate filter, upflow anaerobic sludge blanket (UASB), fluidized bed feed and the membrane solids separation. Overall, these shall be covered and discussed further in details later part. Basically there are two types of anaerobic digester, one is categorized as a standard-rate and the other one is the high-rate. Both methods are developed to treat sludge and high-strength organic wastes. To differentiate between the two, the standard digestion process is usually left to react on its own without application of heat or stirring action. Because of these factors, it will lead to longer reaction period thus dragging the overall detention time limit stretching as long as 30 to 60 days. Compared to the high-rate anaerobic digestion reactor, heat is applied and stirring effect is introduced to allow the mixture to completely homogenize. This typically will reduce the standard detention time to less than 15 days. Sometimes depending on the application, there are setups that utilize and make use of both the standard and high rate process to combine into a two-stage system which are packaged into one in order to take advantage on the individual pros and cons. Usually in the first stage, the sludge will be allowed to completely mixed using a stirrer and heated up at the same time and after that allowed to settle in order to get the supernatant layer and the digested sludge solids. Both layers can then be separated by a simple decanting facility. Let us study and analyze the first reactor configuration as mentioned earlier which is the Anaerobic Contact Process. Normally the system is used to treat high COD and BOD industrial wastewater by means of diluting the incoming waste strength, achieved by mixing the processed and stabilized sludge solids with the influent. The reaction and breakdown of the waste compound is done under complete anaerobic condition and the mixture must be properly mixed and homogenized. Formation of supernatant and digested solids can then be separated and the discharged effluent will be partially recycled and returned back to the incoming wastewater. This configuration will reduce the amount of sludge normally produced in a typical anaerobic process and overall the detention time to complete the whole cycle can be between 2 – 10 hours. In terms of process efficiency expressed in percent of COD removal, typical data of 75 – 85% should be a realistic figure to aim for in a highly optimized setup. In order to understand the conversion pathways happening in the anaerobic digester, let us go deeper into the microbiology aspect. Usually degradation of organic compound will occur in 3 steps. First is the process known as hydrolysis involving breakdown of complex compounds such as protein, lipids into simpler molecules like amino acids, fatty acids which can be readily used. The second process which is also called acidogenesis will utilize the end product from the first process to further degrade it into lower molecular-mass intermediate compound usually done by facultative bacteria to form hydrogen and acetate. Finally methanogenesis will take place in the last step in which strictly pure anaerobic bacteria will play their role to convert the intermediate compounds to methane and carbon dioxide. This is the most important part of the anaerobic sludge treatment system as most of the stabilization process is accomplished during this stage. In order to maintain a well-working highly efficient setup, the most important parameters which have to be taken into consideration are the pH (ideal range should be between 6.8 to 7.4), nutrients in terms of nitrogen and phosphates; and also the temperatures depending on whether mesophilic or thermophilic bacteria are present in the systems.